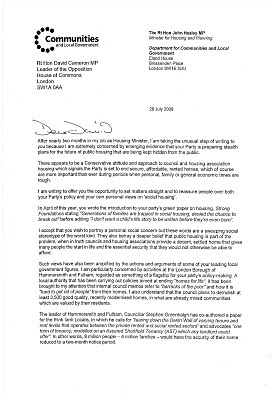 Given the assertions made by David Cameron during his disastrous public meeting at St. Paul's Church, Hammersmith, I thought readers might like to see the letter sent to him by the Rt Hon John Healey MP, the Minister for Housing and Planning. Some have suggested that the most generous excuse for Mr. Cameron's apparent lack of understanding about H&F Conservatives plans to knock down over 3500 council homes and force residents out of the borough was that he was badly briefed or even misinformed by local Conservative councillors. That’s a possibility for sure. However, John Healey’s letter was sent to Mr. Cameron on 28th July 2009. In it, the Housing Minister directly asks Mr. Cameron to explain where he stands on these highly controversial plans. 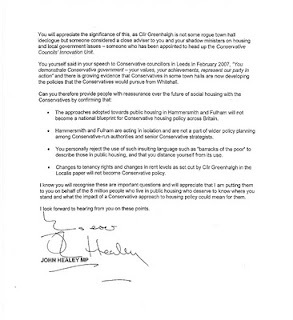 Mr. Healey also asks David Cameron to set out what his position is on the policy proposals put forward by H&F Conservatives to remove a gamut of tenants' long-standing rights. It is therefore very hard to believe that the Leader of our national Opposition would ignore all this at the time and then six months later fail to ensure that he was fully briefed before coming to meet the people of Hammersmith. I’ll leave you to make your minds up concerning Mr. Cameron's handling of this issue and I'll leave it to John Healey's letter to shed some more light on Mr. Cameron's approach to dealing with the public on matters of great personal concern to them. Please click on both pages of the letter to expand and read in full.